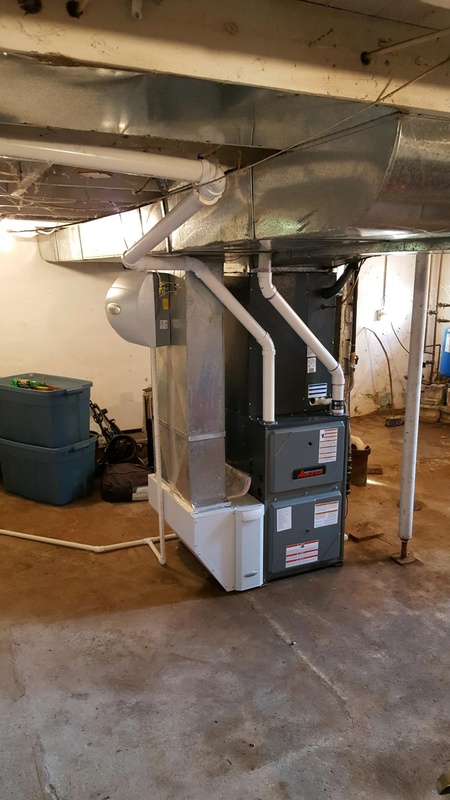 At Pine Tree Heating we are dedicated to helping you decide what HVAC equipment is best for you and your home. From A (air conditioning) to Z (zoning) our knowledgeable staff can help. Amana brand heating and cooling systems are a part of the tried and true legacy of one of America’s most recognized and respected brands. Originating eight decades ago in Amana, Iowa, the brand is synonymous with long-lasting, premium quality heating and air conditioning equipment. Chances are, you and generations before you have enjoyed the dependable performance and longevity the Amana brand continues to deliver. 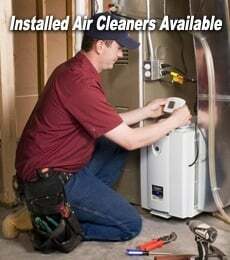 We sell and install a variety of air cleaners, depending on the needs of your household. We have several sizes of basic pass through air cleaners in different configurations that attach into the ductwork. We also have electronic air cleaners that keep your family extra protected against allergens, viruses, bacteria and airborne mold spores. Aprilaire is one of our predominant brands of air cleaners. We also sell Amana and a few others, depending on your system needs. We can sell and install air purifiers as well. What is the best humidity level for your home? Between 30-60 %. Too little humidity causes as many problems as too much humidity. Our technicians can help find the right balance. Aprilaire is our predominant brand of humidifiers and dehumidifiers. There is a sea of choices in thermostats, from single to multi stage, auto changeover to WIFI enabled. Our technicians have the knowledge to sort through them all and get you up and running. 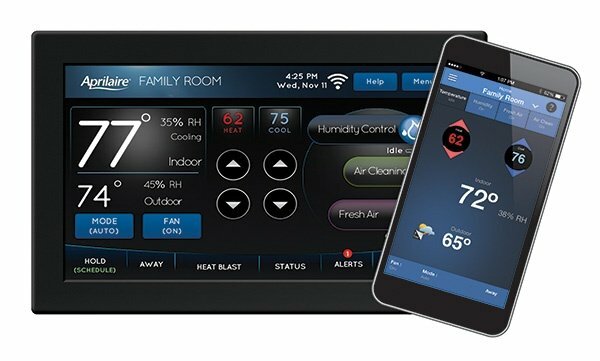 Depending on your household needs and features you want Aprilaire is one of our predominant choices in thermostats. 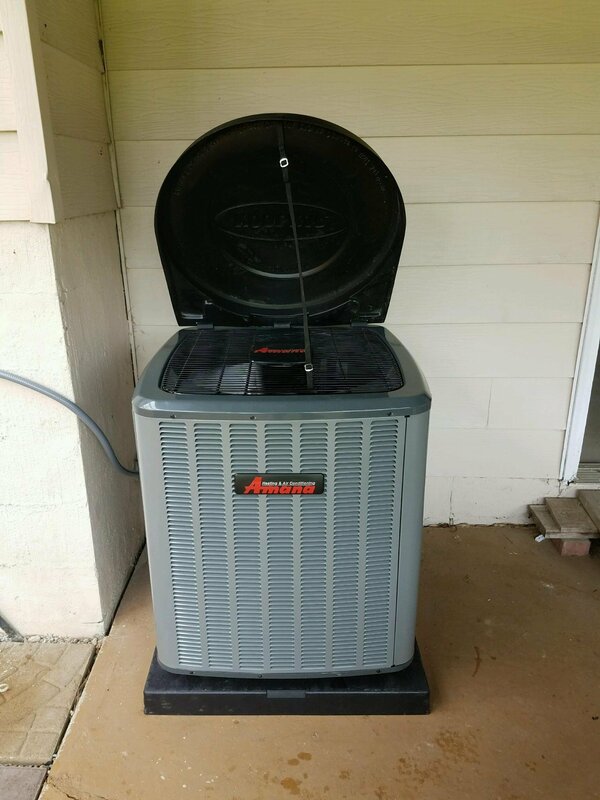 Every year we have many people call to ask what the best way to cover their air conditioning unit outdoors for the winter. We do not recommend covering the entire unit, as moisture will be trapped inside the cover and cause problems. The Kool-Kap covers the opening, preventing leaves and ice build up on the fan yet allowing the air conditioning unit to breathe and even run when necessary. Three sizes to choose from.